Surprisingly not as much gear as you'd think. I like to keep things basic and simple, for me its the best way to get natural looking quality photographs. I don't run around with a bag of 15 lenses, 10 flashes, 4 camera bodies and bunch of other stuff when most of the time all you need is one camera and a versatile workhorse lens. So lets see what I actually use, and when I use those pieces of equipment. The most important part, in my humble opinion and probably most peoples, is your camera body. I run a D7100 with a D3100 as a back up. The D3100 is old and basic, but as reliable decent camera bodies go its a great back up. It takes great photos and has a decent sized sensor. Some of my favorite photos I have taken have been with this camera. Having said that, a couple years ago when I started taking photography more seriously, I needed something a little more, that's where the D7100 came in. A high end Nikon Crop sensor camera. Its awesome. Great in low light with a huge ISO capability. Built in timers. Awesome sensor. And Full HD video shooting. I love this camera. Maybe I could've gone full frame but for the money I don't think I would've gotten any more camera for it. Expensive and bigger isn't always better, especially when it comes to photography. I am currently looking at getting a smaller, more compact, sized camera for the times when I don’t want to carry around a heavy DSLR, e.g. when I’m hiking or climbing or backpacking for long days or multiple days. This is a problem because Nikon don’t really do a small sized decent compact camera anymore - not one that I’m a big fan of anyway. The old J1 is probably my best bet but it’s old and discontinued. Maybe I’ll have to step into the world of mirror-less and just become a convert. Or just shoot entirely in film on my two old 35mm cameras. Here's where you get to get some cool stuff. I love Lenses - they can transform your camera. Right now I have 3, actually 4, Lenses that I use pretty regularly. My main work horse lens, that is on my camera I'd say 90% of the time is my Tamron f/2.8 17-50mm lens. Its an incredible lens. Wide enough for Landscapes and night photography, fast enough for sports and street photography and a great depth of field for portraits. The one lens that has been taking away some camera time from Tamron is my Nikon f/1.8 35mm prime. I love how simple and fast this lens is, incredible for portraits and a pretty great all rounder because of its simplicity. My other lens that doesn't get used as much as I want to is my Sigma f/3.5 50-500mm telephoto. I only really use this for taking long shots in the mountains or close ups of the moon or for getting some good foreshortening effects. I never stop looking at lenses. I always want something else, but right now I have a good mix. My next acquisition will probably be a better mid focal length lens. 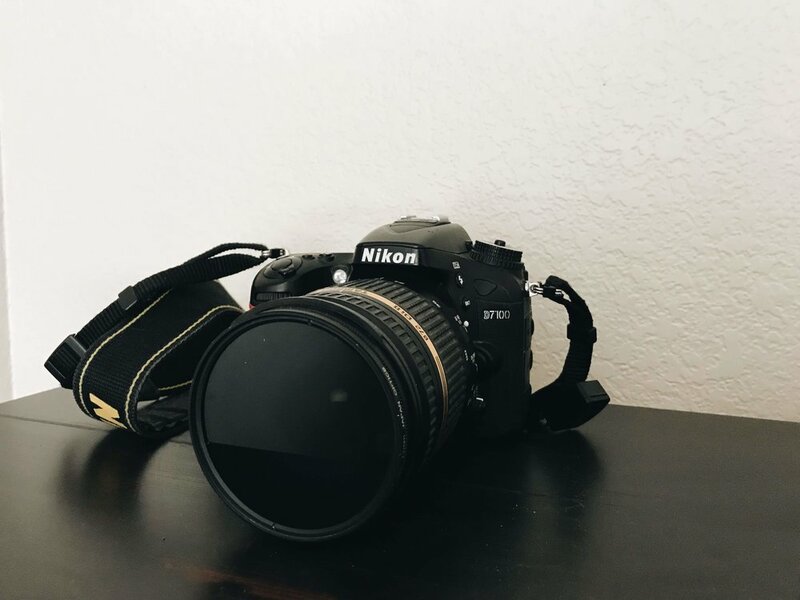 I have an old kit lens that goes from 18-135mm, but tis not a very good lens, so something maybe from 18-200mm, like the Nikon DX Nikkor 18-200mm f/3.5-5.6G ED VR II Telephoto Lens. That should sit perfectly between what I have and be ideal for landscapes. Or I’ll end up getting a prime 10mm wide angle, because who doesn’t want a super wide prime lens? I could've separated all this stuff out, but it would've been boring for me and you. I basically don't have much extra gear as I like to shoot handheld for the majority the time. And if you take anything from this section is that you don't have to buy the most expensive gear to get great photos. Tripod; I bought a half decent K&F concept tripod from amazon, its light enough to carry and sturdy and tall enough to get good results. No carbon fiber for me. I also bought a remote trigger too, a Polaroid, even though my camera has a built in setting for timers and time lapses, I like using a remote trigger to capture the night sky to keep my camera as still as possible while hitting the shutter. Filters; I do actually think spending some good money on filters is well worth it. A good quality polarizing filter should be the first on your list, especially if you intend on taking lots of landscapes. After that I have a good set of graduated ND filters. I use Cokin filters. But any reputable brand is good. Lighting gear; I don't have much of this as I prefer shooting in natural light as much as possible because no matter how you argue 99.9999% of the time natural light looks much better that artificial. Having said that, shooting indoors can be tricky without some good artificial light, so I use some general LED light bars, with adjustable brightness, softness and color. They don't cost much and they do the job perfectly. I can’t remember the brand. Some off-brand stuff form amazon because I don’t have the money for the high end stuff. Carrying and transporting all this gear can be a pain and I’m yet to find or see a camera bag that can fit a good amount of gear, basic hiking equipment, and be comfortable to wear on hikes. So I don’t use a camera bag. I have one, I just don’t use it other than to transport my gear, as luggage. When I’m hiking, climbing, or shooting, I’ll have a backpack on or a shoulder bag with just the gear I’m going to need packed around the other stuff in there. My camera bag is arguably a good one. Its full waterproof and can hold a decent amount of stuff. I can fit 2 bodies and 3 lenses and still have room for other misc stuff like chargers, cards, batteries etc. and it has the ability to have stuff strapped to the outside. Its just uncomfortable and makes me look and feel like a turtle. Having said that and just bashed all camera bags with one fell-swoop, the one company (yes I’m sure there are more) that I wouldn’t mind using is Peak Designs. Their bags look like bags, they look comfortable and they have a decent amount of space for all the stuff you’ll need. Their clips and straps are also a excellent idea, super ease of access and less clumsy than the traditional strap that swings around your neck like a pendulum.